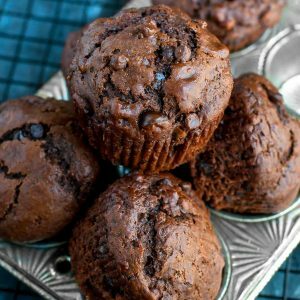 These Bakery-Style Double Chocolate Banana Muffins are fluffy and flavorful! Whisk together the first six ingredients in a large bowl: flour, sugar, cocoa powder, baking soda, salt, and baking powder. In a medium bowl, whisk together banana, yogurt, oil, applesauce, and egg until blended. Add to your flour mixture and stir just until moistened. Grab a muffin pan fit for a dozen and line with paper or parchment muffin cups three-fourths full. Bake on center rack until a toothpick inserted in center comes out clean, approx. 20-25 minutes. Cool 5 minutes in pan, then transfer to a wire rack. Serve warm. Extra muffins may be frozen and reheated for a rainy day treat or individually wrapped and stored at room temperature for a few days.